On Thursday noon, April 11th, 2013 the rector of the National Technical University of Athens (Athens Polytechnic School), Simos Simopoulos, took the political decision to repress counter-information media by cutting off network access to Athens IMC (athens.indymedia.org) and 98FM self-organized radio station (Radiozones of Subversive Expression). He thus undertook the political responsibility to impose censorship and stifle the expression and free movement of ideas of all those who resist the contemporary fascistization and social impoverishment. Simopoulos—being the second Rector of Repression after Markatos, 18 years ago—decided to be the one to intervene in place of the state power, and what’s more, he undertook the role of mouthpiece facilitating the work of the Repression minister Dendias, the cops and the Nazis. Faced with immediate interventions of solidarians to the counter-information media, including many university students, the rector literally hid himself, authorizing the vice-rector to continue his repressive work, a task that the latter finally refused. Simopoulos has already surrendered without resistance the academic-educational knowledge to the profits of enterprises and multinational corporations that prey on the public education sector, and now he also chose to throw away the resolutions of student associations that endorse free access to counter-information from within the premises of their faculties. The rectorial authorities of the National Technical University of Athens used a legalistic maneuver, and amended their network infrastructures regulation, requiring that names of persons be registered for each internet socket in the Athens Polytechnic. The two counter-information projects refused to hand over names of individuals, contravening this reasoning of legal representatives. Meanwhile, the rector flouted the resolutions and signatures of the Athens Polytechnic student associations that authenticated the IP addresses in accordance with the recent amendment to the network infrastructures regulation. On Monday, April 15th, solidarity action went onward to a symbolic occupation of the rectorate at Zografou campus, during which 98FM radio station broadcasted online for a while. 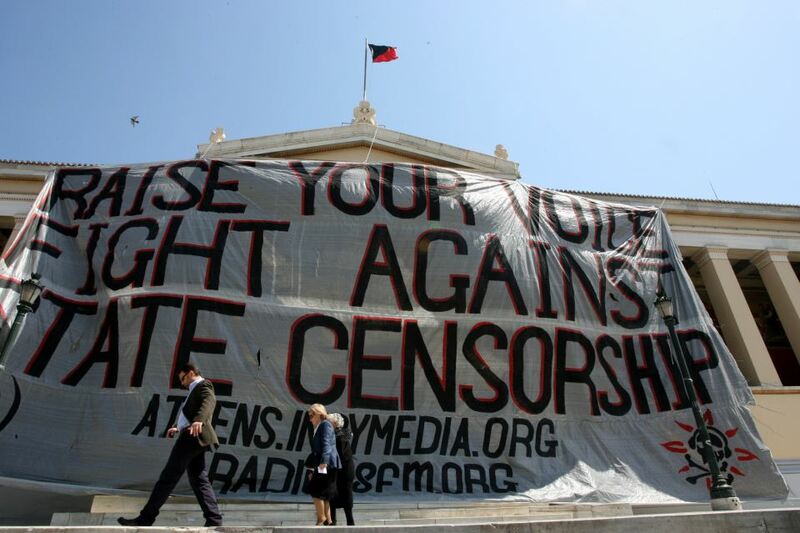 Shortly before Athens Indymedia would start to emit as well, these same repressive mechanisms disconnected the internet provision in the entire Athens Polytechnic campus. This second gagging attempt against Athens Indymedia and 98FM radio station clearly illustrates the intensity of state repression as well as the ever more overt censorship; a state censorship fueled for years, among others with the shouts of today’s Nazi MPs, and lawsuits filed by mega-publishers like Alafouzos, but also on the request of a single professor to the Polytechnic School, a high-profile academic that collaborates blatantly with the gold mining company Eldorado Gold, publishing ‘studies’ for the pillage of natural resources and the environment in the region of Skouries, Halkidiki (northern Greece). Athens Indymedia was born from the grassroots global movement after the 2001 large anti-globalization demonstrations in Genoa, Italy. It is part of the movement, providing a foothold for its expression. It has contributed greatly to dissemination of information from below, and coordination among popular struggles that occurred over these years. Athens Indymedia was present in protest marches, claims through various different activities, and denouncements of the state arbitrariness. It gave food for thought, reflection and exchange of views. It nurtured critical thinking, political fermentation and the different opinion, the one that is systematically concealed by governmental and corporate media. However, what’s most important is that Athens Indymedia highlighted facts of the political life that otherwise may have stayed buried forever. The regime’s media of state propaganda would never have mentioned the torture and murder of migrants, nor the police arbitrariness, let alone the unprovoked police violence and assassinations that are often used by the state power—like the case of Alexis Grigoropoulos, who was shot to death by the cop Korkoneas in 2008. Mass media grow through freely given public resources to be able to hypnotize an entire society with their propaganda, lies and misinformation; to be competent to establish a society consisting of their subordinates. They would never have mentioned all of these facts because they (businesspeople such as Bobolas, Alafouzos, and Co. …) are closely related to corporate interests and directly affected by social struggles. This entire mob not only supports, but more often causes, endorses and ensures formally and informally the conditions of people’s impoverishment, operating hand in hand with the State of the far right. Besides, a long-standing demand of the far right has been the shutdown of Athens Indymedia. Today, 46 years after the regime of the Colonels in Greece, the junta is being reinstated: the dictatorship of the Troikans—consisting of domestic and external officials of the ECB/EU/IMF Troika. The new regime gradually embraces and adopts all the means and ways of the junta’s enforcement powers, first and foremost the silencing of other considerations and the banning of free movement of ideas and freedom of speech, against those who refuse to reconcile with the perpetuation of exploitation of man by man and the lifelong continuation of social inequality. The gagging of counter-information media, as well as the imprisonment of fighters that defend the land in Skouries, Halkidiki,* against the greedy interests of the gold mining company, clearly show us what kind of policies and methods the government is using to stay in power. Thus, a series of murderous memoranda with the Troika, which have brought about 4,000 suicides to date, further reduction in wages and pensions, around 30% unemployment, with the younger constituting around 60% of all unemployed people, while the Greek healthcare system and the education sector are on the verge of collapse, and public universities are handed over to multinationals, these so-called bailout agreements that will only intensify the impoverishment of society will conveniently and smoothly be called ‘reforms’, and contrary opinions will not be allowed; local struggles against the plunder of nature, earth and life in general will be called ‘terrorism’ while the very destruction of life and nature will be called ‘development’. What’s more, it will be much easier for them to impose a communicative obscurantism in order to keep an entire society into a state of hypnosis, until they exterminate and plunder everything standing in their way. All this is precisely their emblem, and the sooner we realize that we live in a regime of outright dictatorship, the sooner we will be able to halt them. Freedom of speech is an inalienable human right that only in fascist-totalitarian regimes is suppressed. What they do not understand though is that information cannot really be suppressed in the era of technology; our life will always seek escape from control no matter how persistently they attempt to repress us. 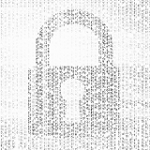 One, two, three… many indymedia sites shall be born and shall win! The river will not flow back! No matter how hard they try to reestablish the 1967 junta, we will not allow that to happen! * Translators’ note: In the early hours of April 10th, 2013, two fighters of the struggle against the gold mines in Halkidiki were kidnapped by the EKAM special police force from their homes in the town of Ierissos (located near the forest of Skouries). Hooded cops literally broke into their homes in the middle of the night, while they were sleeping with their families. Meanwhile, the local police station had been abandoned in fear of retaliation by the residents. Indeed, villagers of Ierissos stormed the police station and burned everything inside, as a first enraged response to the repressive operation. They also set up blockades in the area. Until the 14th of April, the two arrestees were held in the Thessaloniki police headquarters. On that day, prosecutors ordered the pretrial incarceration of both fighters on grave felony charges in connection to an incendiary attack on the Skouries mining site in mid-February 2013.